Marion just completed a five-month application process that established that it has the capacity and community support needed to ensure a successful Main Street program. Mary Helmer, President and State Coordinator for the program, said Main Street Alabama will begin providing “intensive board development…market analysis with economic development strategies, targeted technical assistance, and quarterly training related to downtown development immediately. “When a community is ready for Main Street, as Marion is, our economic development program works,” Helmer said. “It brings jobs, dollars and people back to historic downtowns and neighborhood commercial districts.” Helmer added that the interview panel was impressed by the heartfelt community presentation that demonstrated a love of downtown Marion coupled with a vision for what they could be, and the drive to make it happen. 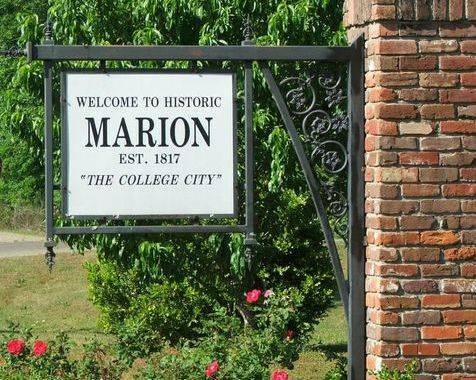 Marion joins Alexander City, Anniston, Athens, Birmingham, Columbiana, Decatur, Dothan, Elba, Eufaula, Florence, Fort Payne, Gadsden, Heflin, Monroeville, Montevallo, Jasper, Opelika, Oxford, Selma and Wetumpka as cities that have embraced Main Street’s approach to revitalization. Each of these cities reports their success in monthly reinvestment statistics monthly, and the results are impressive. Main Street Alabama’s Designated communities have reported 373 net new businesses, 2,774 net new jobs, and 45,213 volunteer hours in their districts collectively since June of 2014. Main Street is a unique preservation based economic development program.